Red & White on Thursday Night | Thirsty Dog Brewing Co. 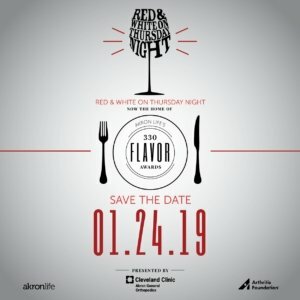 The Arthritis Foundation is pleased to announce the 22nd Annual Red & White on Thursday Night, Akron’s premier food & wine event. Join us and indulge dishes from Akron’s best chefs, craft beers and local and international wines. Now home of Akron Life magazine’s 330 Flavor Awards, the evening will celebrate the top food and beverage talent of the 330 area. Additional highlights of the event include exciting raffles, a unique auction and an exclusive VIP Lounge featuring specialty cocktails. All proceeds benefit the Arthritis Foundation’s mission to conquer and cure arthritis. Thirsty Dog will be pouring Irish Red Setter & Labrador Lager.